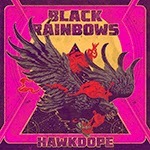 Black Rainbows is a heavy fuzz/stoner/psych/space rock band from Rome, Italy. I have previously reviewed a couple of their albums as well as the Holy Moon EP from 2013 and the four-way-split with Naam, White Hills and The Flying Eyes. It's all been good, solid and rocking stuff, but on the brand-new album Hawkdope the band has really done well. You can hear the influence of both late 60s / early 70s hard rock and psych bands like MC5, Hawkwind and Black Sabbath as well as the later stoner / desert rock bands (Kyuss, Monster Magnet, Nebula, Fu Manchu etc. ), and I really like the mix. The album was recorded by the band leader/guitarist/singer Gabriele Fiori on his own Heavy Psych Sounds Studio in Rome, and he has written all the songs. He also plays some synths, tape echoes, Hammond and Rhodes, which gives the album some more colours and vibes. The killer rhythm section is formed by Dario Iocca and Alberto Croce. The album starts off with the energetic and powerful Nebula / Fu Manchu styled "The Prophet" and there's also a video made out of this great song. Gabriele plays some hot solos and this song really rocks! The fast pounding "Wolf Eyes" sounds like MC5 but with more fuzz, very nice! There's also a bluesy, psychedelic slower part with some cool solo guitar and spoken samples at the end. The long (almost nine-minute) title track "Hawkdope" is more in the Monster Magnet style and rather epic, mid-tempo heavy stoner rock. Excellent! "No Fuel No Fun" is a straight-forward heavy stoner rock piece with some space noises going on in the background. Cool! "Hypnotize My Soul with Rock n' Roll" is perhaps more in the vein of 60's proto hard rock but with the heavy, crunching stoner rock fuzz sound. Again some psychy sounds in the mix as well. "Waiting for the Sun" is a short, more laid-back, bluesy interlude, and "Jesusjudge" rocks your brains out again with some very heavy riffing and beats. There's some organ on the chorus. Suitably named "Killer Killer Fuzz" reminds me of Black Sabbath, but also has some Monster Magnet vibes. The album finishes with the somewhat more atmospheric and moody "The Cosmic Picker", that only gets heavier in the middle but stays slow, hypnotic and melancholic till the end. This album sounds very good and there are no filler songs, so why don't you get it on limited vinyl or CD format, and be sure to catch them live near you on their tour if possible! The band will also play in Helsinki, Finland, for the first time at Galaktus Festival on April the 10th. Can't wait to see them!